In the simplest terms, scars form at the site of an injury to tissue. They are the visible reminders of injury and tissue repair. The occurrence and incidence of scarring is still not well understood. There is considerable variation in scarring between one person and another, indicating that some people are more prone to scarring than others. Acne scarring frequently results from severe inflammatory nodulocystic acne that occurs deep in the skin, but scarring also may arise from more superficial inflamed lesions. Nevertheless, the only sure method of preventing or limiting the extent of acne scars is to treat acne early in its course, and as long as necessary. The more that inflammation can be prevented or moderated, the more likely it is that scars can be prevented. The scars caused by increased tissue formation are called keloids or hypertrophic scars. Both hypertrophic and keloid scars are associated with excessive amounts of the cell substance collagen. The excess collagen becomes piled up in fibrous masses, resulting in a characteristic firm, smooth, usually irregularly-shaped scar. The results of most treatments vary from 30 to 70% improvement. Any better result should be considered as a bonus. Ice-pick scars are acne scars associated with loss of tissue which usually occur on the cheeks. They are usually small with a somewhat jagged edge and steep sides-like wounds from an ice pick. This type of scar is like a small channel, usually not wider than 2 mm on the surface. Keloidal acne scars which are raised and thickened scars which and usually occur in the darker skin type patients. These scars as best treated with intra lesional steroids, Titan infra red light, Laser Genesis and Carboxytherapy treatments. The Boxcar Acne scar is a depressed fibrotic scar that is usually quite large with sharp edges and steep sides. The base of these scars is firm to the touch. Ice-pick scars may evolve into depressed fibrotic scars over time. These scars respond well to a combination of Dermaroller ™ Skin Needling and Laser Genesis ™ treatments. Dermal fillers injected into the lesion also improve the appearance of the acne scar with time. PIH or Post Inflammatory Pigmentation is discoloration of the skin at the site of a healed or healing inflamed acne lesion. It occurs more frequently in darker-skinned people, but occasionally is seen in people with white skin. Early treatment may minimize the development of post-inflammatory pigmentation. Some post-inflammatory pigmentation may persist for up to 18 months, especially with excessive sun exposure. Topical products such as the newly launched Luminesce range by Lamelle chemical peelings and may hasten the improvement of post-inflammatory pigmentation. The objective of scar treatment is to give the skin a more acceptable physical appearance. 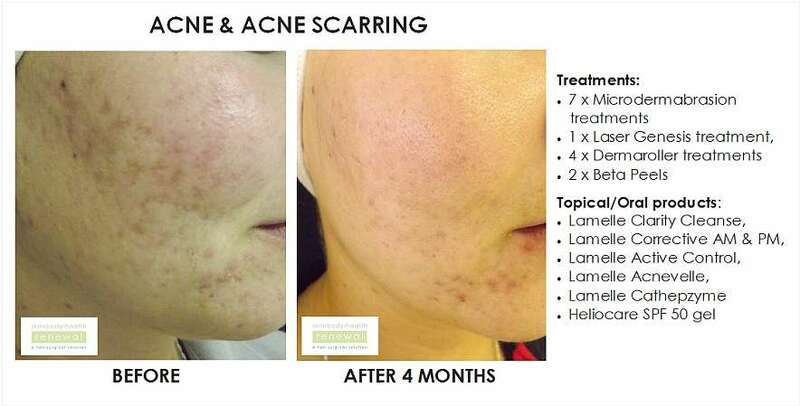 Total restoration of the skin to the way it looked before you had acne is often not possible but scar treatment does usually improve the appearance of your skin. Laser treatments with Laser Genesis or Pearl Laser may be used to recontour scar tissue and reduce the redness of skin around healed acne lesions. Hyaluronic dermal fillers are injected under the skin to "stretch" and "fill out" certain types of superficial and deep soft scars. Hyaluronic acid treatment usually does not work as well for ice-pick scars and keloids. With normal microdermabrasion, only the very surface cells of the skin are removed, so no additional wound is created and there is no downtime. Multiple procedures are often required but scars may not be significantly improved unless combination treatments are done. Keloidal acne scars are treated by injecting steroidal drugs and Botox into the scar after a Laser Genesis treatment. At Skin Renewal we pride ourselves on careful attention to each patient. A highly professional team led by a medical doctor assesses every patient and an appropriate combination treatment is recommended. Every client is provided with a customized solution depending on expectations, budget, anticipated downtime and medical conditions. A series of 4 to 6 treatments are usually necessary to treat acne scars. Acne scars in skin of colour have traditionally been very difficult to treat with lasers. AT Skin Renewal a series of Laser Genesis treatments combined with Carboxytherapy or Skin Needling is promising to be one of our star performers for acne scars in people of colour. Combined with the correct product range, Post Inflammatory Hyperpigmentation PIH can also now be successfully treated. At Skin Renewal all patients with skin conditions are treated holistically by our qualified medical doctors who have experience in treating acne. In other words, in an acne consultation at Skin Renewal, your doctor will take a comprehensive history to ensure that there are no underlying medical conditions which are contributing to you acne. Adequate stomach acid destroys pathogens bacteria, fungi, parasites etc) and a lack of stomach acid can lead to bad bacteria proliferating in the small intestine dysbiosis (bad bacteria) and unwanted parasites which have Health Renewal ramifications down the line. How can we expect to stay healthy and have healthy skin without constant breakouts and other Skin/ Body/ Health Renewal conditions if we have chronically poor nutrient and mineral absorption due to incomplete digestion? My overall experience is amazing. My therapist is very good at what she does. She explains procedures before they done and she always ensures That I am comfortable. I visited Skin Renewal Willowbridge branch for Skin Needling. My therapist Candice was amazing as always. She explained the full procedure and completely put me at ease in terms of any discomfort I would experience. After numbing, the procedure was surprisingly not as painful as expected and all in all, this was an amazing experience from start to finish. The treatment is quite short from a time perspective but the results are amazing. There is a "lifting" of some of the pigmentation that enhances the complexion. It's also always a pleasure to be in the safe hands of an experienced therapist who manage the treatment effectively. The treatment I received helped me restore my skin, treated acne scars and added a fresh look to my skin - Lourita is excellent! She keeps track of my details, she knows what needs to be done and does it it nicely and diligently. I’ve received treatments by Shanice for the past year. Shanice has performed wonders on my skin! She is always great at making treatments less painful and is really helpful in recommending creams that have also reduced the appearance of both my active acne and it’s scarring. I would definitely recommend Dermapen treatments as well. Skin Renewal has reduced my scarring to a point where I am able to leave the house without makeup - something I would have never dreamed of before this year! Shanice is always very helpful, really takes her time to achieve the best results. Great massage :) I feel confident letting her touch and treat my skin. Review -I wanted more, better results! Over the years I have tried almost everything out there to soften my acne marks. Peels, products, laser, microdermabrasion, collagen fillers, supplements and close to 2 years of Dermapen. Which was very good and had good results. I wanted more, better results that last. And I found it! After a visit to Dr Maureen, she recommended I try Subcision. I hadn't even heard of it. She explained the procedure and what I could hope for in results. The procedure was quick with minimal/manageable pain. I had some bruising and swelling on my cheeks afterwards for approx 4 days. The result truly was astounding and totally worth it. After just one treatment the visible difference is so good people have commented, even my own dermatologist! It is by far the best treatment I have ever had for my acne marks. The true results became most visible to me 2 months following treatment. Thank you, Dr Maureen. Review -Service is out of this world! Treatment is working wonders to my skin. Therapist customer service is out of this world. Always great coming over for my treatments. Review -Results continue to amaze me! I have been a loyal customer with Skin Renewal for 2 years and my reason for returning is the wonderful treatments (peels & dermapen) I receive from Lezanne. She knows exactly what my skin requires and results continue to amaze me. She is an asset to this company and can't praise her enough! It has been a journey to get here! I arrived with active acne that was treated through a series of peels. Now that my skin has stabilized, I was left with acne scarring, which is being treated with Dermapen. After the first session I could already see the results, so today I am back for my second! From the Reception to the treatment room, all staff are friendly and helpful. My therapist is knowledgeable, provides sound advice with my treatment packages and always does so with a smile. All treatments I have received has been done so professionally and I will continue to recommend and use this branch. Landa is always very pleasant. Her infectious smile just brings about a welcoming feeling. Which leads one to become very comfortable here at skin Renewal. She has a genuine interest in her clients and can adapt and relate to all individuals enabling comfort, openness and trust. She is thoroughly professional, extra caring and very honest. She is pretty too. Awesome service from an awesome person. All treatments have been explained thoroughly by both the doctor and the therapist. Ilona is always friendly and welcomes any questions that one may have and she takes her time to answer any queries. Review -The overall service is refreshing! I have been a long time clients at Skin Renewal and to date am very pleased with the service. I see Liezel as my therapist and Dr Cecile Baard for other treatments. The environment is always relaxed and friendly and I always enjoy my visits, even the ones that are somewhat painful. Review -Starting to see positive results! Nicole has been absolutely professional. I am starting to see positive results with my skin. I am thrilled. Thank you! Great experience and treatment, with amazing results! I would just like to send a quick thanks to all the ladies (and gents) who do such a brilliant job! The good experiences started in April when I met with Dr Graham for a consultation about my acne scarring. Since, I have been for three treatments in DermaPen Needling (one with Dr Toni and the other two with Dr Dominique) and most recently, enjoyed my Birthday facial. I would also like to thank the therapists; Kerry and Dourina who always looked after me so well before, during and after each treatment. Your whole team, from the Doctors who do such a brilliant job (and have given me the exact results I was looking for!) and the therapists who are fantastic; thank you to everyone for making my visits at the Skin Renewal clinic so enjoyable. My skin looks and feels fantastic!